Sandisk has joined the Marvell chipset club for its latest SSD, and the Extreme II 240GB is a rather tasty bit of silicon. But with so many drives using the same controller, are we not entering into the SandForce territory of days gone by, where all drive performance was relatively equal? Not really, and here's why. The process for an SSD manufacturer used to be: Grab a controller chipset off the shelf, bung some memory chips onto a PCB, and you're in the SSD business. Well, that's what it felt like for a while, what with everyone jumping on the SandForce bandwagon, and the fact that SandForce controllers come with ready-cooked firmware and few options to stand out. At least, that was true until Intel came along with its own take on SandForce SSDs, but even then, the performance profile was all very familiar. We suspect Intel's tweaks to the SandForce firmware focused on reliability. These days, of course, the customer chipset of choice is none other than the Marvell 9187. The difference is, you have to bring your own firmware to the party - Marvell doesn't supply one. That mainly means two things. For starters, the barriers to entry are that bit higher because you have to have enough nerds on the payroll to develop a full-on firmware. Secondly, it means there's a little more variation between SSDs based on ostensibly the same controller. In the old days you saw SandForce on the spec sheet and you knew exactly what to expect. That's not the case with the Marvell controller. 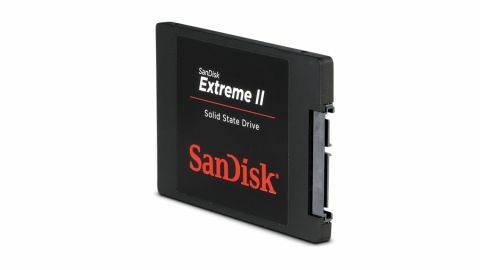 What sort of a fist has SanDisk made of the 9187 chipset in this latest Extreme II SSD, then? Pretty stellar, actually. Direct comparisons with the other Marvell 9187 drive in this test, the Crucial M500, are tricky due to the gap in capacity. The number of memory chips per channel does influence performance. But there's little doubt SanDisk has done a great job. There really are no weak points in the performance package. What's more, SanDisk serves up a meaty five-year warranty as standard, which should cover the vast majority of users very comfortably indeed.